I’m related to a pioneer pilot (and considered in his time to be one of the most daring of professionals) Archibald “Arch” Hoxsey. At one time, Arch set the world’s altitude record when he rose to over 11,000 feet. He had the American record for sustained flight across country, making the non-stop 190 mile flight from Springfield Illinois to Clayton, Missouri on October 6th 1910, and there he took ex-President Roosevelt for a flight in St. Louis. The event is recorded in a silent movie you can watch below. Imagine the technology 100 years ago when you watch this barnstorming video. I wonder if Roosevelt blew chunks? Arch was a celebrity in airshows and traveled extensively with the Wright brothers. Four of the early aviators (John Moisant, Ralph Johnstone, Charles Hamilton and Arch Hoxsey) were among the celebrities pictured on “tobacco cards” that were distributed with packs of cigarettes in 1910 and 1911. These cards were called “Champion Athletes and Prizefighters” and they competed with baseball cards of the day. Archie Hoxsey flew most often with Ralph Johnston; together they were known as “The Stardust Twins” — filling newspapers with race reports, contests and adventure. 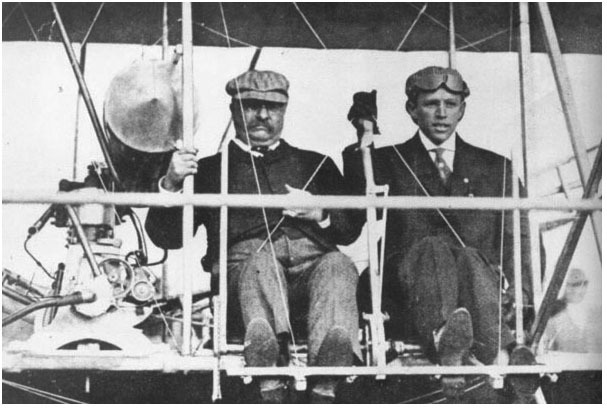 The same day that Roosevelt went for a ride with Arch, so did my great grandfather, Governor Charles Deneen of Illinois, becoming the first Governor to fly. There are several pictures of this as well. My father, CSD 2, became a Naval Aviator serving during WW2 and Korea due in part to his grandfather’s description of this flight. Looking for ancestors of George Washington Eckles who was my husband’s great grandfather and he had a brother named William. Both of these men fought in the Civil War and also in the Battle of Chickamauga. Capt. Eckles stayed on this area of Dade County, GA. Who was Archie’s parents and grandparents? Hey! This means we are related. My son and daughter are proud to have Arch in the family tree and I see a lot of that pioneering and adventuring spirit in them. The Hoxsey’s are related to me through my maternal grandmother who grew up in St. Louis. Do you know about the Hoxsey who was drowned as a “witch and paranomal” in Rhode Island or the famous belles of society, Hoxsey sisters whose jewelry was on display at the St. Louis World’s Fair? Another one of the family was an opera singer and we still own her Steinway. Quite a storied clan.